Oh have I got quite treat for you! 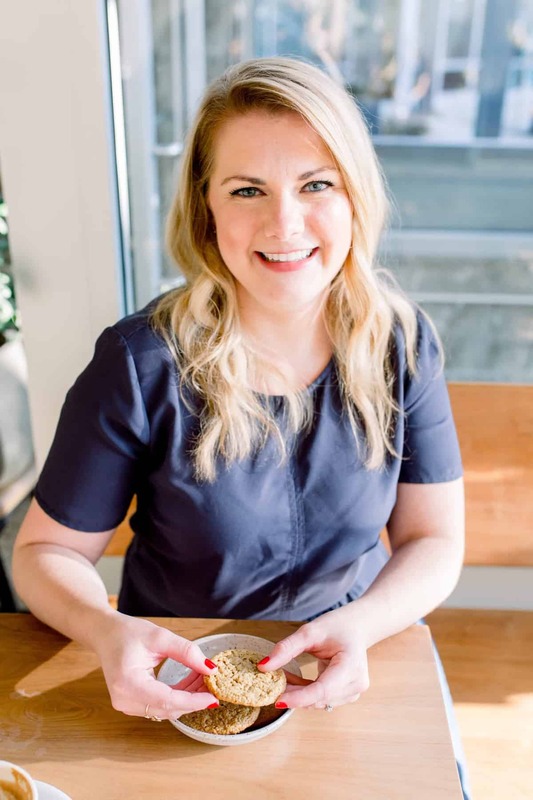 Inspired by a recent trip to NYC, Sara, Kelsey and I have decided to bring you recipes from my now favorite place probably in the big Apple, Butter and Scotch. We visited Butter and Scotch on our first night in the city, knowing we were going in for two of your favorite things, desserts and cocktails! Turns out, it ended up being a place full of to die for sweets, peanut butter old fashioneds, and kick assume bartenders that danced around to 90s music. Basically, this place is heaven! 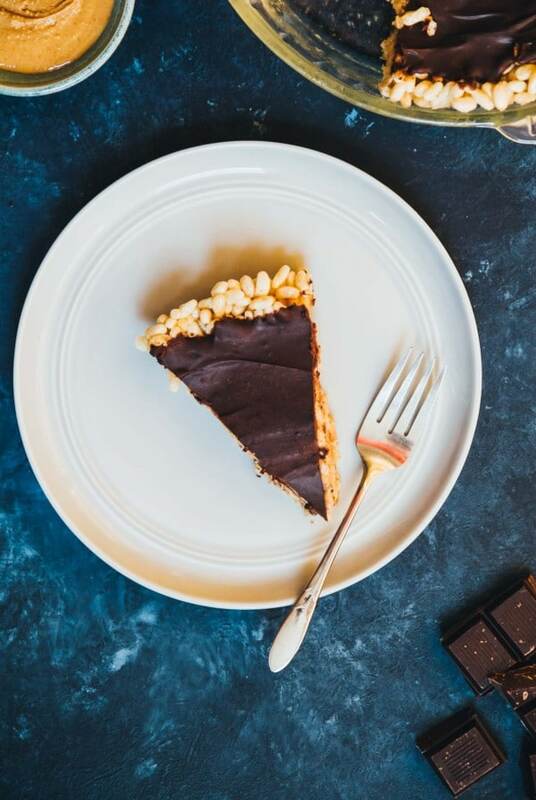 When we went to Butter and Scotch, we shared a slice of birthday cake, a sprinkle filled cookie and one of three best pieces of peanut butter chocolate pie that I’ve ever had to date. 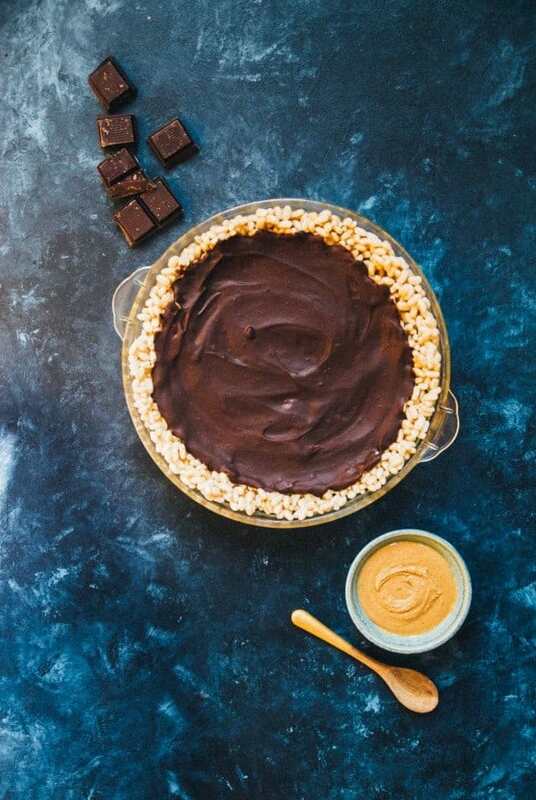 While this peanut butter chocolate pie recipe isn’t exactly the one they served in the bar, it is a variation on their Whatchamacalit pie in their cookbook, blending together my two obvious favorites, peanut butter and chocolate, plus pouring it over a crispy rice krispies crust. Full disclosure, regular pie crust isn’t my absolute favorite thing in the world (just give me the filling already), but when a pie uses a variation like pretzel crust or rice krispies? You can count me in. I mzybe/possibly/for sure ate a piece of this bit by bite of the fridge the other day, no judgements. I also am coming up with approximately 1000 different ways to use a rice krispy crust now, so stay tuned! Take me as your warning, when you grease the pie pan, don’t bet overzealous with the nonstick spray in fear that the pie will stick. If you do, some of the pie can end up getting soggy on the bottom and make everything much together after refrigeration. 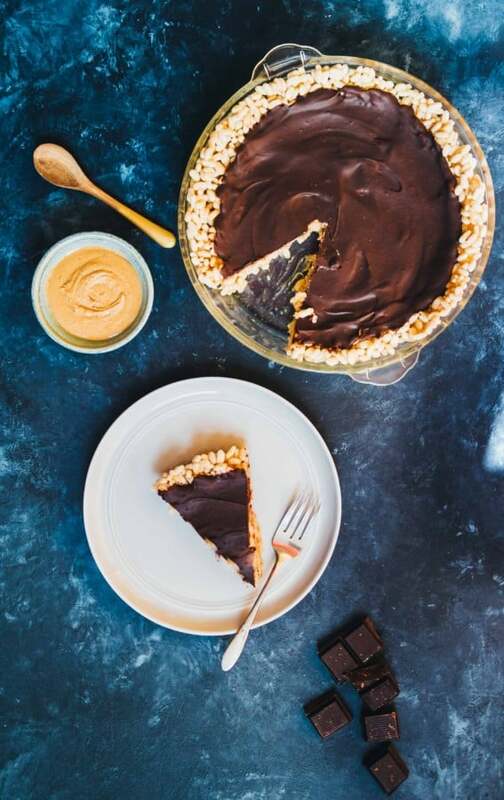 This vegan peanut butter chocolate pie is also best served right away, or it can soften too much at room temperature. I personally also used the puffed rice cereal that is found at most stores, but any kind of krispies cereal should work here, as long as it’s pressed into the pan firmly enough. 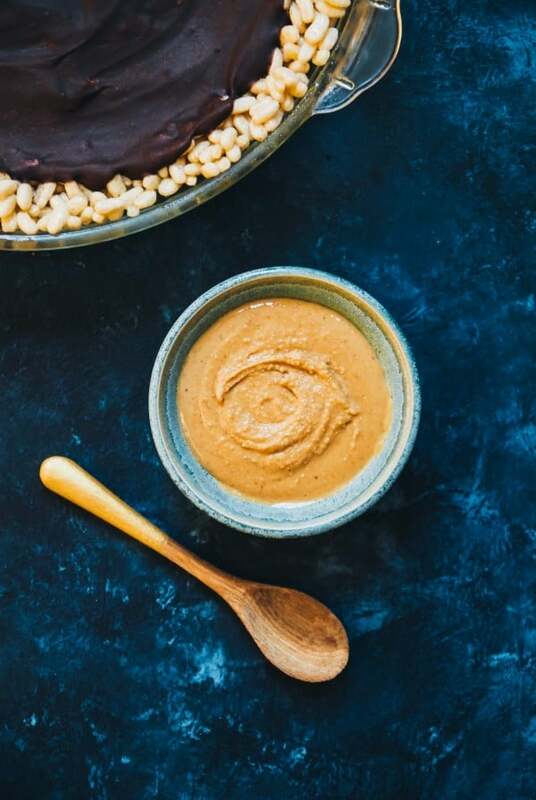 A sweet and crunchy twist on a classic peanut butter chocolate combo! Inot a saucepan, melt together the olive oil and brown rice syrup over medium high heat for 2-3 minutes. Once brown rice syrup has melted, remove from heat and transfer to a large bowl. Add the puffed rice cereal and mix until cereal is evenly coated. Press mixture firmly into a lightly greased pie pan and place in refrigerator. In a small bowl, combine the coconut milk, peanut butter, powdered sugar, and coconut cream. Mix mixture together with a spoon until it starts to come together, then whisk mixture until smooth. Pour the mixture over the rice krispies crust and place back into refrigerator. In a small, microwave safe bowl, combine the chocolate chips and coconut milk. Microwave in 30 second increments, until chocolate has melted completely. Top pie with the melted chocolate and smooth over the top of the peanut butter mixture evenly. Refrigerate for another 2 hours, until mixture has firmed. Slide a small serve immediately. I agree with Kelsey – let’s go back! I was totally giving this recipe heart-eyes in the book, so I’ll have to get around to making it at some point. AND Kelsey’s unicorn treats. Ah! So much to do! Ah I know! I just want to have a party with ALL the fun treats! Ohmigosh. I just looked at the menu for butter and scotch online and I’m having MAJOR sweets cravings. I need to visit this place next time I’m in NYC!!! I really like the idea of the Rice Krispies crust but I’m concerned about it getting soggy. Do you know how it holds up in the refrigerator? It holds up well in the fridge!